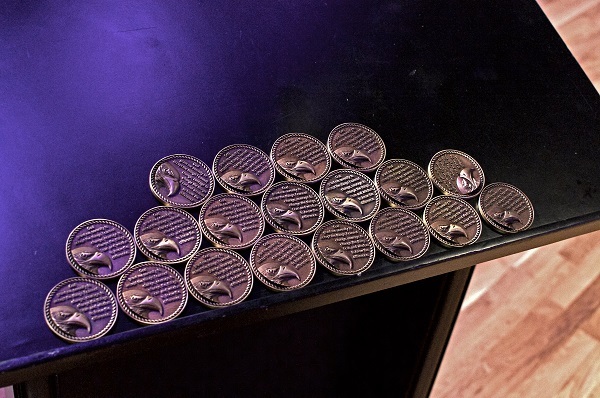 SoberNation writer Tori Skene wrote an excellent piece on the StepUP program. Give it a read along with the other wonderful SoberNation content! Thanks for the shout out Tori! My name is Emma S. and I am a Junior at Augsburg majoring in Psychology and minoring in Business Administration. I am originally from Colorado and I’ve been in StepUP for three years. I love playing intramural soccer, to paint and to draw. Also, I like green apples. Why did you come to StepUP? 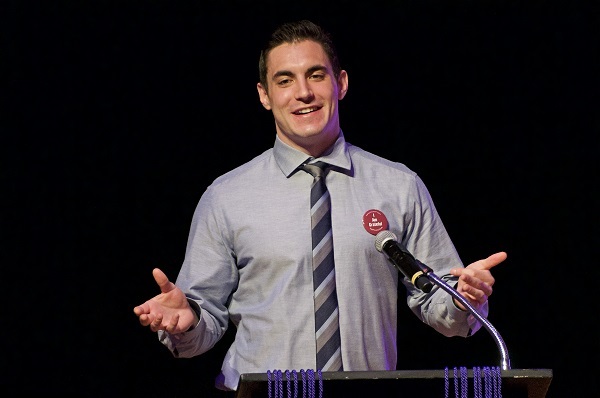 I came to StepUP because I wasn’t going to stay sober as a freshman in college without it. I first heard about StepUP from students that came to speak at the treatment center I was in. There were other schools I checked out, but StepUP had such a large sober community compared to the others, and Augsburg seemed really cool. My higher power is definitely number one, although it can be hard to stick to it and have faith during difficult times. I have found that when I have faith, I always turn out ok. I also go to meetings and have a sponsor. I don’t litter, because I used to litter a lot. It’s easy to tell when I’m not on the right track because I tend to think about littering more often, along with participating more in gossip and negative self talk. I know that when my recovery needs work, I’ll be able to tell by paying attention to what is going on in my thoughts or my school performance. If I need help, the StepUP community, wider recovery community and my family are always there to support me. You need to come in wanting success, in school and recovery, for yourself. Doing it for someone else will not work. Get involved! Keep up momentum! These things will lead to happiness and continued sobriety. Connect with people, don’t isolate. StepUP is going to be what you make it, so putting in the work will pay off. Speaking of getting involved, what is up with Leadership Team? I’ve been a part of leadership team for a little over one year. We are a group of StepUP students who volunteer our time to help improve our community. There are three ways that we do this, and each has a “chair” on leadership team who is responsible for it. These are service, events and advocacy. 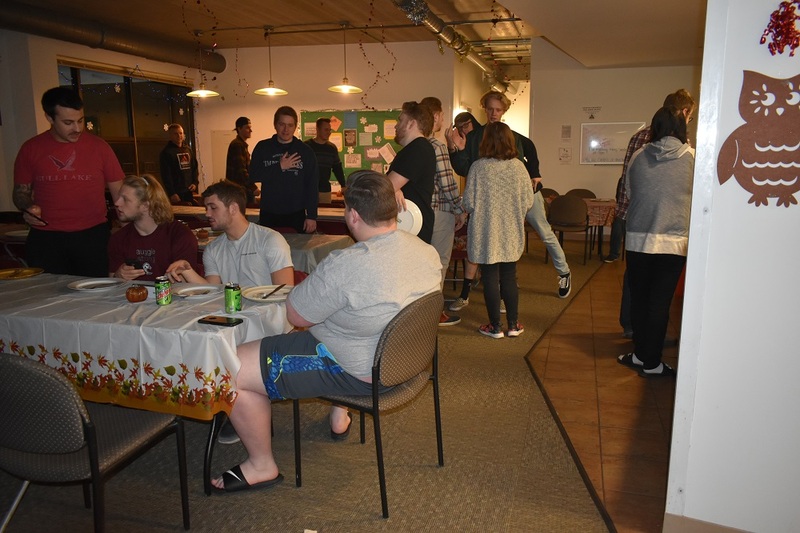 Service chair was my position for most of my time on the team, it was my job to go out into the community and find opportunities for StepUP students to be helpful to others, especially to those in recovery. When I found service positions, we would announce them during StepUP’s Big Circle meeting so people could sign up to volunteer. Service is very important because you are essentially the face of StepUP to the city. That goes for the service chair and the students volunteering. Another position is Events Chair. They are responsible for organizing an event for StepUP students once a month, which has been very important for connecting the community. 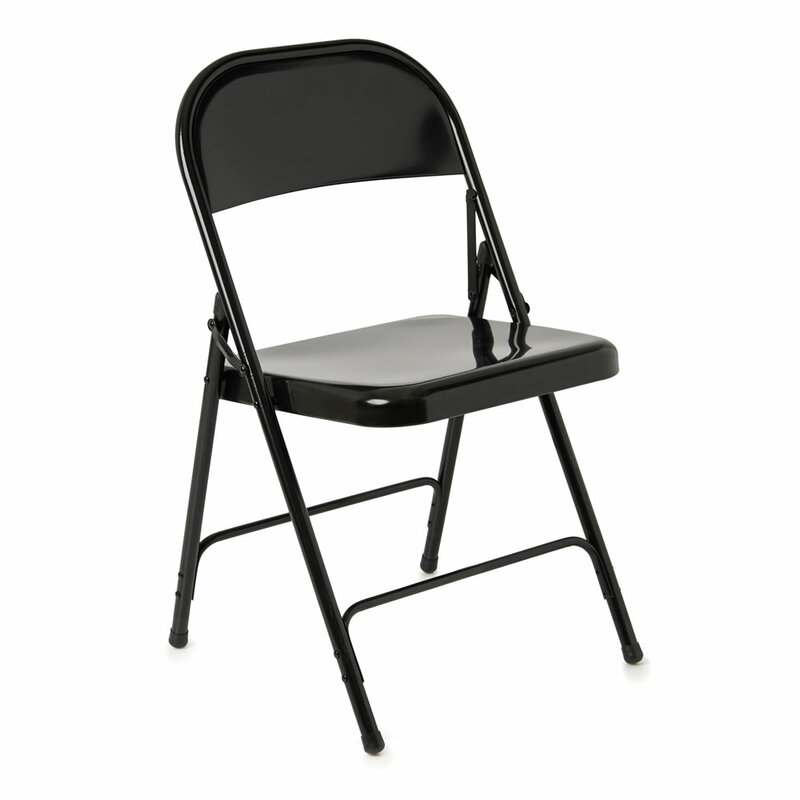 And finally there is Advocacy Chair. Their job is to hear students needs and to communicate them to staff. I am now the Leadership Chair, so I “manage” the 3 chairs, and connect with the StepUP director, Tam, to update her on what we are up to. We are always taking applications for leadership team! You can attend one of our meetings the day you apply. Angus & Julia Stone. And some G-Eazy because he is my husband. Some Billie Eilish. I’ve always listened to a lot of rap music but I’ve been slowing down on that because a lot of it has some really negative messages. Good vibes and positivity is what I need. Abnormal Psych. I want to do clinical psychology so it’s exactly what I will be dealing with in my career. I want to go to graduate school for clinical psychology. There are a lot of possibilities still, so I am focusing on the semester for now. Just remember to take it one day at a time. If we can just finish today sober, we’re golden. It’s important never to forget that. 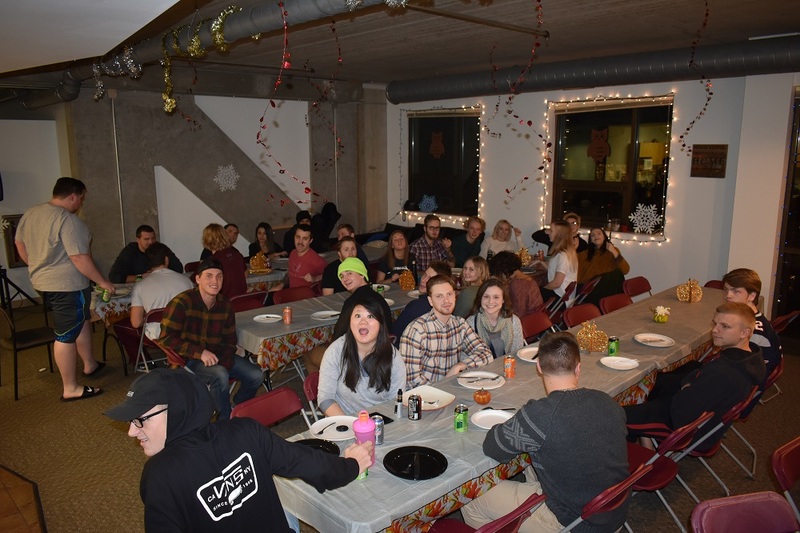 I’m not sure how we manage to pull off a full thanksgiving dinner for dozens of students every year, but somehow we did the impossible again: got a bunch of addicts and alcoholics to cooperate and organize a nice meal. And it went off without a hitch! I honorably did my duty with my roommate Bryan and made about one and a half gallons of gravy. The ingredients included gravy powder, water and butter. Complexity of that recipe aside, Bryan looked very stressed watching the massive stockpot full of water barely budge in temperature with only 30 minutes to spare before dinner. I told him that a watched pot never boils but he didn’t seem consoled. Each dish was assigned to one apartment or group of flat mates. Five turkeys in five ovens. Owen showed off his cutlery skills and carved up every one of them himself! I’ve heard reports that StepUP student and Thanksgiving enthusiast Ben founded the “clean plate club”, of which he was later denied membership due to not meeting its one qualification. Tragic. Although the subject is controversial, there has been some consensus about which dish was the best. The dish described to me as an “Oreo pudding thing” was a massive hit. I would love to give my compliments to the chef, but it’s a bit of a mystery who brought it (according to the one person I asked about it). Maybe the Oreo pudding was always there? The true heroes of this story are Daniel, Emma, Alexa, Sophie, Moses and Annie. They were the main people responsible for the cleanup. Thanks guys! I’ll make a better gravy next time. 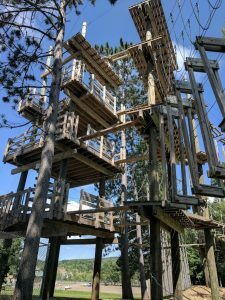 It’s a StepUP tradition to take our new fall students to conquer the ropes courses at Trollhaugen in Dresser, WI. The goal of the ropes course is simple, get from point A to point B. 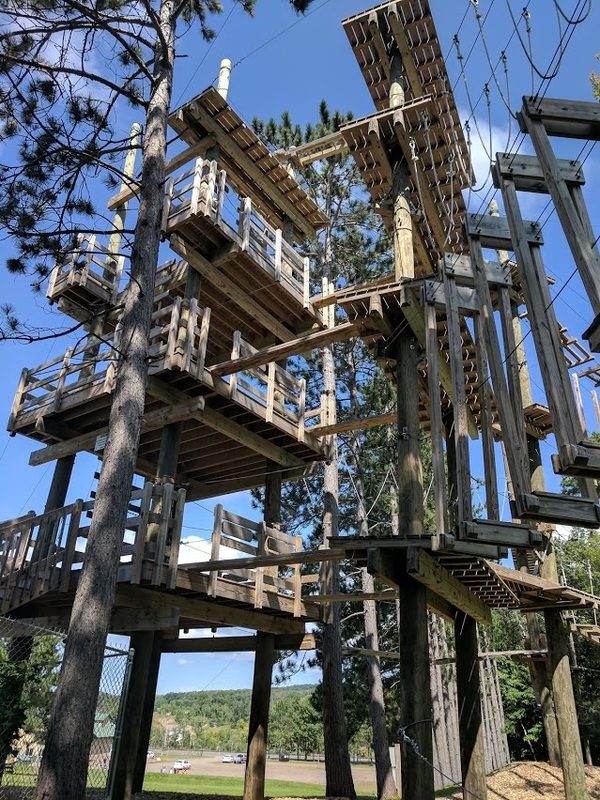 Of course, most of the course is made up of wooden platforms anywhere from 12 to 48 feet in the air, connected by bridges made of zip lines, tires, ropes and wooden planks. Our new students, their mentors, StepUP Peer Advisors and some StepUP staff suited up in safety equipment and took to the trees to kick off the new school year! On the bus ride there, emotions were varied. Among the attendees we had hikers, mountain climbers, and people with a serious fear of heights (and everything in-between). “Not every fear needs to be conquered”, new student Tommy told me as the coach bus pulled into the parking lot. I told him that conquering a fear with no significance in your daily life may seem pointless, but it’s a good workout nonetheless. I say that now, but when I came to Trollhaugen last year as a new student, I convinced myself that we hadn’t enough time left to try one of the more difficult courses (we did), and that I wasn’t skipping it because I was scared (I was). This time I was on a mission: successfully complete the most difficult route. 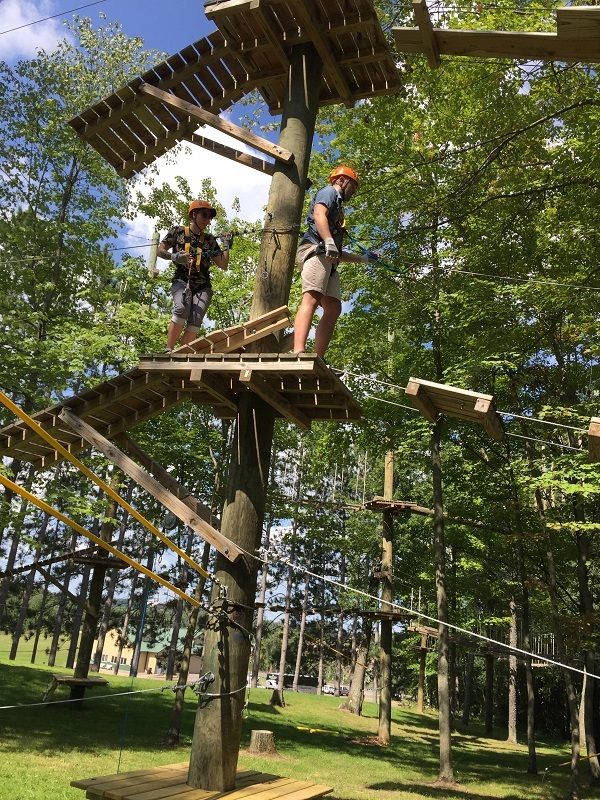 After a quick run through the intermediate blue courses, another student and I approached the elevated platform that led to either the secondary blue course, or the black. We both decided to just hop up the ladder to the black before we could talk ourselves out of it. 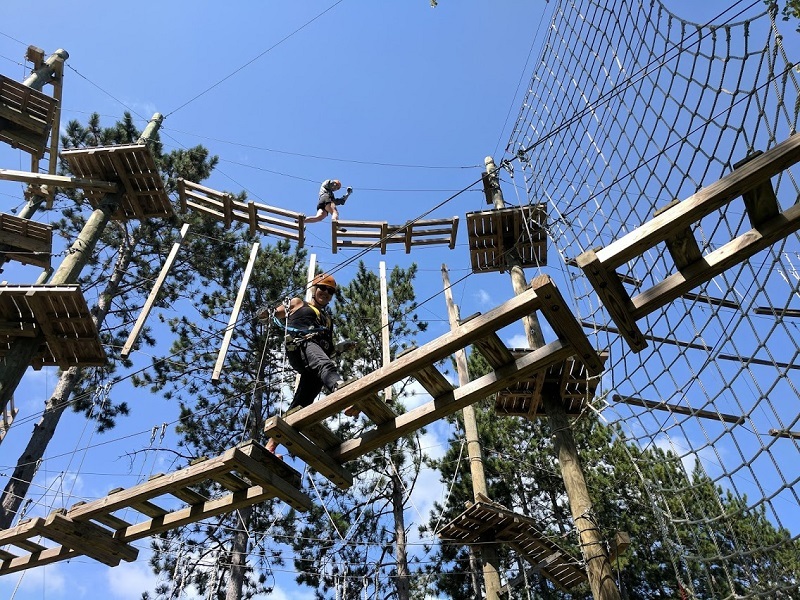 The first obstacle was a short set of monkey bars, 48 feet in the air. Even with the nearly fool-proof safety equipment, dangling from that height by our fingers was quite the barrier to entry. Ahead of me were two new students, Foster and Sophie, and behind me was another new student named Moses. While waiting for Foster to swing over to the next structure, I was able to divert some of my own anxiety by delivering a pep talk to my apprehensive new friends. The four of us all made it over and we were on our way. About halfway through the course, Sophie had her first anxiety inducing moment. She wasn’t particularly afraid of heights, but bees were a different story. The two of us were sharing a tiny platform on a nearly 50 foot pole when a wasp took a keen interest in her. The only escape was to zip line across about 25 feet to the next platform, but she would have to wait until Foster was finished clipping to the next “element” of the course. After a couple tense minutes of buzzing, she finally launched off of the platform under siege, and on to the wasp-free one. After the four of us completed the course, I met back up with Tommy, the new student with a serious fear of heights. He told me that yes, he had completed the course. When I asked him if it felt great to conquer his fears, he chuckled and told me no, it didn’t feel that great. I suppose that is the reality of pushing your boundaries of fear and proficiency. Sometimes you don’t get a pleasant rush as a reward. But it does often make it easier to approach something threatening next time, even in a completely different domain, like applying for a high status job, or being honest and vulnerable in a relationship. When I came to Trollhaugen as a new student, I thought I already knew my own competence and ability. My experience shows, however, that I have absolutely no idea what I’m capable of until I’ve measured my expectations against reality. That is- just try it. It risks sounding like a platitude, but most of the students I talked to had a similar experience on the ropes course. All of us had some expectation of what it would be like, and how we would perform. And to some degree, we were proven wrong. Here’s to carrying that memory into our recovery and our educations. We are once again falling into the trap of waging war against inanimate substances. And we will continue to lose. It was about three months after I had a major surgery, and I had just stumbled upon the surplus Percocet tucked away in my parent’s bathroom closet. The surgery was called the Nuss procedure, which necessitates the controlled fracturing of the entire sternum and most of the upper ribs. Pain management is a serious concern. Oddly enough, my pediatric surgeon sent me home from the ICU with exactly double the amount of oxycodone that my painkiller regimen actually called for. He also made a cheeky joke about “being careful” because these “sell for a lot on the street”. I imagine it was just a miscalculation of the sense of humor a 15 year old might have. But I knew the truth behind the quip. I had already experimented with numerous drugs at that age, but never an opiate. Opiates were the forbidden fruit. I fancied myself an “educated” drug consumer, and all of the others like me that I had met online repeatedly said never to play around with benzodiazepines, methamphetamine, or opiates. Too risky. When I found the bottle of 30 five-milligram oxycodone tablets in that closet, my first thought was “well, I better just be very careful”. That is how I found myself googling the proper dose for a first time recreational user of oxycodone. You see, I was very methodical about it all. I was certain that addiction was a consequence of carelessness, and could be avoided with the prerequisite knowledge and planning. Two friends of mine and I took 15 milligrams of oxycodone that summer before high school, and I ate the fruit. Those three white tablets were the final handshake I made with the devil. When I felt the first wave of euphoric bliss pass over me, I had the keen sense of making a secret agreement. The feeling of relief from existential angst, depression, soreness, embarrassment, and insufficiency was so profound that my barely developed brain absolutely folded in submission. Someone to blame – first clandestine meth labs, then imported Mexican cartel meth. Subtle support for the status quo – “crack downs”, raids, new laws. If you have read any reporting on the opioid epidemic, you might recognize that pattern. We have a not-so new group of drugs being pitched as a new scourge on society, a new demographic being effected, an evil cabal of pharmaceutical companies fueling the epidemic, and some status quo interventions being marketed as revolutionary. So I ask myself, is this a case of an evil drug, or just a continuation of a general addiction epidemic that responds to demands for different substances from decade to decade? I think it is almost certainly the latter. Dr. Joseph Lee of the Hazelden Betty Ford Foundation agrees. In an interview with MinnPost he says “Addiction has never really been about drugs. Addiction is about the people who are at high risk for becoming addicted to those drugs.” Dr. Lee, a psychiatrist and expert on addiction, thinks the focus on specific drugs or classes of drugs is completely misguided and will lead to more panicked tail chasing while people continue to die. “If we invested in people as opposed to focusing on drugs, I think we’d have a much, much smaller problem on our hands”, Lee explains. The focus on opioids in isolation is not exclusively the product of ignorance and hype. The fact is, someone that becomes addicted to heroin is at a much higher risk of an early death than someone addicted to cocaine. This is just a function of the physiological effects of opiates (overdose, combining with other respiratory depressants). Despite my concerns, the urgency of watching a rising death toll has been put to good use. As far as I can tell, there has never been so much media and political attention on recovery and addiction treatment. Public acceptance of Narcan distribution is incredible. There have also been real crimes and failures of foresight in the medical industry that needed to be brought to light. But along with the good, there is some bad. Besides addicts, many people get caught in the crossfire. Legitimate pain patients have a harder time getting effective medication and impoverished neighborhoods get more dangerous as the drug war increases in intensity. We are once again falling into the trap of waging war against inanimate substances. And we will continue to lose. When the media subtly anthropomorphizes heroin and other opiates as predatory agents in society, it props up the narrative which justifies the draconian, misinformed and (most importantly) failing policies of the war on drugs. Nobody has been more thoroughly failed by these policies than the addicts themselves. Approaching addiction this way is myopic, and will once again catch us by surprise in the next decade when a different drug becomes popular. Whether we are using the framework of hereditary predisposal, economic despair, corrupt pharmaceutical giants, or spiritual maladies, we must never forget what we are actually talking about when we talk about addiction: human beings. 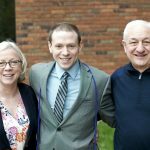 I became convinced that recovery schools and collegiate recovery programs were the future of substance use disorder treatment and stigma reduction. Having pretty limited experience with airline travel, I was a bit nervous on my way to the Minneapolis-St. Paul International airport. “I feel like something will go wrong”, I confessed to my girlfriend on the way to the terminal. I was on my way to Washington D.C. for the Association for Collegiate Recovery in Higher Education’s annual conference. The opportunity to travel for work and school was an exciting prospect, not to mention being able to leave Minnesota for once without bleeding out my bank account. So despite my apprehensions I was in good spirits as I was herded through security. Everything went perfectly fine until my flight got delayed twelve hours. Attempting to sleep on the floor of the terminal was completely futile. It was a rough night (Shout out to the old man that brought me a blanket and pillow). Eventually I made it back on the plane and left for D.C. I wasn’t exactly bright eyed and bushy tailed, but my excitement for the conference was not completely crushed. Once I was all checked in and got my little name badge with the bright red “first timer” ribbon adhered to it, I checked the conference schedule to see where I ought to be. I was somewhat anxious that I would fall through the cracks and miss something important, fueled by the fact that I was there by myself and everyone in this city walked with a sense of purpose and had somewhere to go. The schedule said that there was a recovery meeting ten minutes out and I was already in the right building. Perfect. Of course I should have been looking for a meeting already. Staying in an airport full of bars, stressed out, by myself for 12 hours wasn’t tempting exactly- but it was spiritually exhausting. There I met Abby Foster of Heroes in Recovery, an organization that interviews people in long term recovery about their experiences, and hopes to reduce stigma surrounding substance use disorders. We had already been in brief contact about doing an interview for the website. Abby was one of the many people I met at the conference that exemplified the hard work behind the nationwide recovery advocacy and collegiate recovery movement. After the meeting and being interviewed, my exhaustion subsided a bit and I became more aware of the big picture of what we were doing here in D.C. Here were hundreds of clinicians, professionals, students and professors all with the express goal of placing a collegiate recovery program in every school in the country. It didn’t take long to get swept up in the excitement. I started to make plans for next year. StepUP ought to bring more students, we ought to host a presentation on student leadership in a CRP etc. In the swampy July heat of Washington D.C. at George Washington University, I became convinced that recovery schools and collegiate recovery programs were the future of substance use disorder treatment and stigma reduction. This conference was the first time I had seen so many intelligent, capable and passionate people all working towards a common goal. That could be due to my limited experience in the professional and academic world, but I do think the ARHE and the schools involved are special. 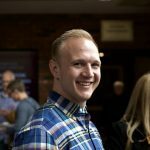 The ARHE and Hazelden Betty Ford sponsored town hall on the opioid epidemic was a powerful thing to be present for (video link below). If you ever have the chance to be a part of recovery advocacy on this level, please do. My involvement in StepUP has a new significance in my mind now. This isn’t just about Augsburg, this is about recovering young adults all over the world getting the same chance at an education that I did. Opioid Townhall Video – Live from George Washington University – can be found on our Facebook page. 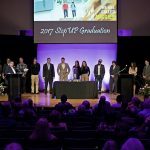 April 28th 2017 was the StepUP graduation celebration. 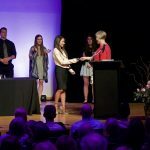 Thirty students graduated the StepUP program this year, seventeen of which graduated Augsburg College. The event was opened up by Vice President of Student Affairs Ann Garvey, who gave us a wonderful introduction to the students who are moving on. 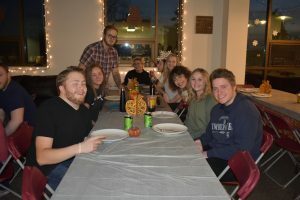 She reflected: “And of course, while we planned on you arriving at this point: from using, to treatment, to recovery, to Augsburg, to graduation- it’s a little sad to see some of the faces out there.” Indeed it is, but as she later mentions, StepUP has a constantly growing network of alumni. Our spirit of service and community will keep graduated students in contact for years to come. After Ann finished her introduction, we heard from StepUP Director Patrice Salmeri. Patrice introduced the staff, and guided the parents of the graduates through a “trip down memory lane”. She asked them to remember their son or daughter as just a kindergartner, and then an elementary school student- full of potential. To remember how things started to change in junior high or middle school, when they discovered a new friend in drugs and alcohol. How a distance started to grow between themselves and their child. The purpose of this reflection was to introduce a powerful idea: the child in front of them now is the same child they saw back in kindergarten- a child they once feared was gone forever. 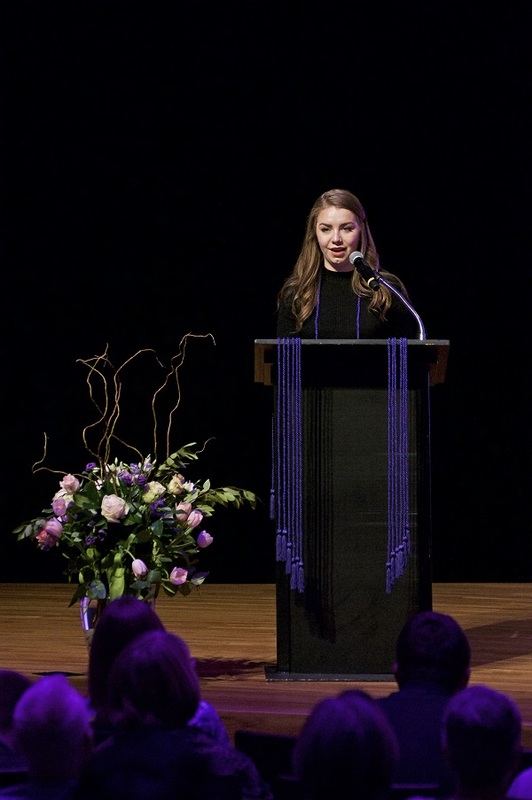 Patrice asked the students to relish in who they had become, the family they had become through conquering their fears, the shared grief, and their individual accomplishments. Most recovering people will acknowledge that humility is essential in facing the challenge of continued abstinence and healing. That day some pride was well deserved and appropriate. 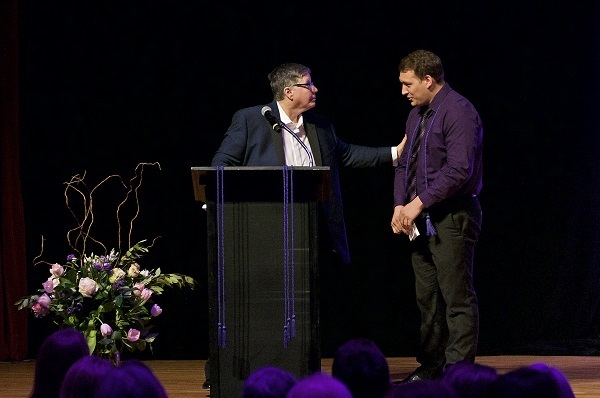 During the first medallion ceremony, Patrice gave a brief introduction to some current and graduated StepUP students that are now graduating Augsburg College. After telling us the degree they earned, and honors they received, she presented them with a beautiful medallion to commemorate their graduation from the StepUP program. Later in the program, each StepUP counselor brought the students they had been working with on stage and did the same. Today Audrey says yes to all the challenges she can handle, but no more than that. She explained how she adopted a legacy of values from StepUP, and hopes to leave a piece of her own: “When I came to StepUP I tried to be everything that I was not. So thank you for helping me find out who I am”. 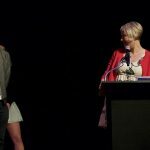 After Kristin Wilcox presented her students with their medallions, the audience enjoyed a slideshow of the graduating student’s journey through StepUP. 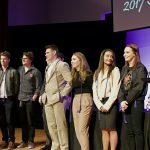 After all the sighs and chuckles from the photos captured over the years, Shane Jensen brought up his students for their medallion ceremony. After giving a brief acknowledgment to all of the people that helped him succeed, we moved on to the medallion ceremony for Thenedra Root’s students. The last of the evenings programming was the sand ceremony. 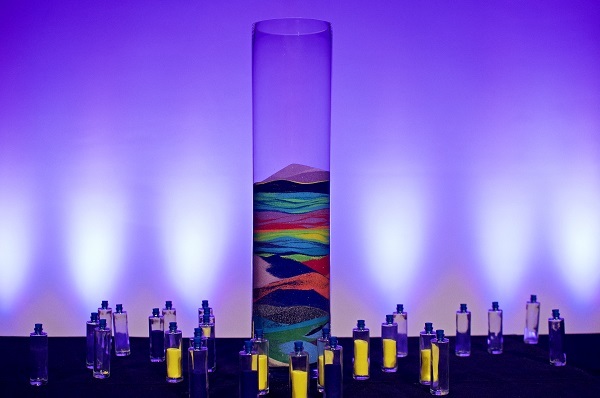 For the past nine years, StepUP graduates have been pouring colored sand into a glass cylinder. Why the sand ceremony? 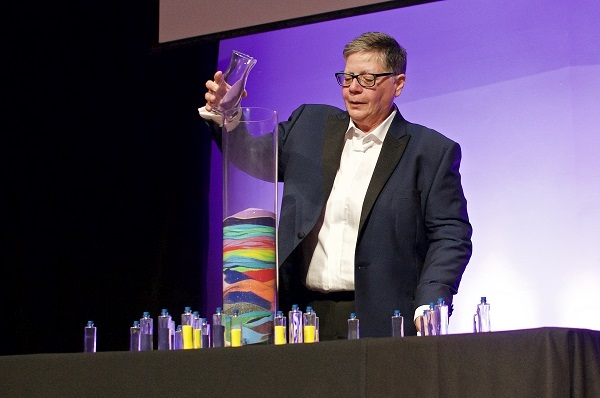 Patrice explains: “As I pour the sand- and you can see the sand that’s been poured over the past nine years- you can’t separate grains of sand from one another. Just as you can never separate yourselves from the experiences you have here. The sand will stay forever.” She adds “You are adding to so many groups of students who have gone before you, the legacy piece. It’s about the community of people coming together, and holding a space for each other. It’s about how StepUP will always be a space for you. And you can never separate yourself from that.” Each student then poured their little portion of yellow and purple sand (this year’s StepUP colors). Congratulations to the thirty students who graduated, and thank you for the legacy you left behind.